Corral Canyon Ranch, homesteaded in 1880, is located in Corral Canyon in Maricopa, California about 35 miles from Taft, 40 miles from Ojai and 95 miles from Burbank. 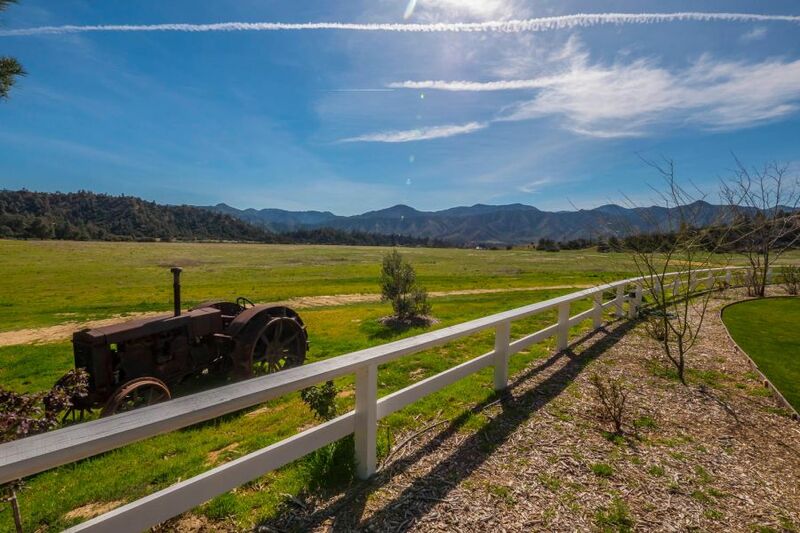 This 277+ acre horse ranch surrounded by the Los Padres National Forest offers the tranquility of country living in Ojai’s back country surrounded by the vineyards, orchards and farms of the Cuyama Valley. 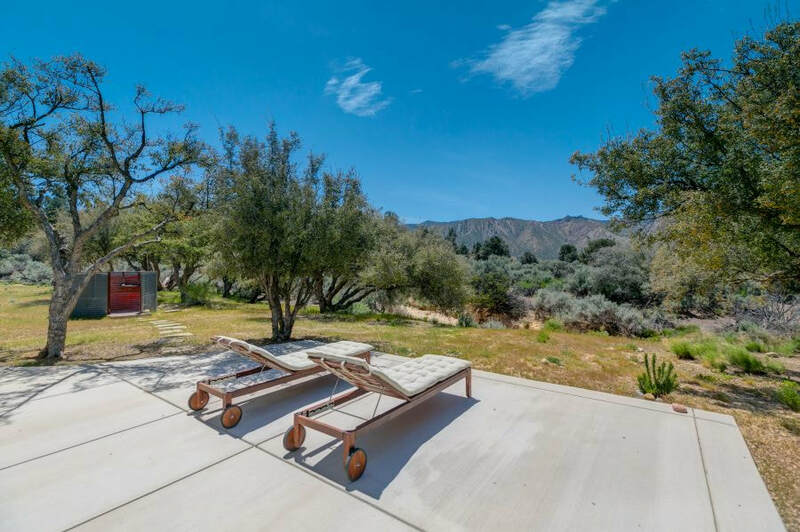 Less than two hours from Los Angeles, this mostly flat property is set against the backdrop of the stunning Sierra Madre Mountains. Activities that can be enjoyed on the ranch and surrounding lands include extensive trail riding, hiking, cycling, camping, hunting, and photography. Homes on this turnkey ranch include the Ranch House, the Bunkhouse, the Homestead House, the guest house, and the caretaker’s house. 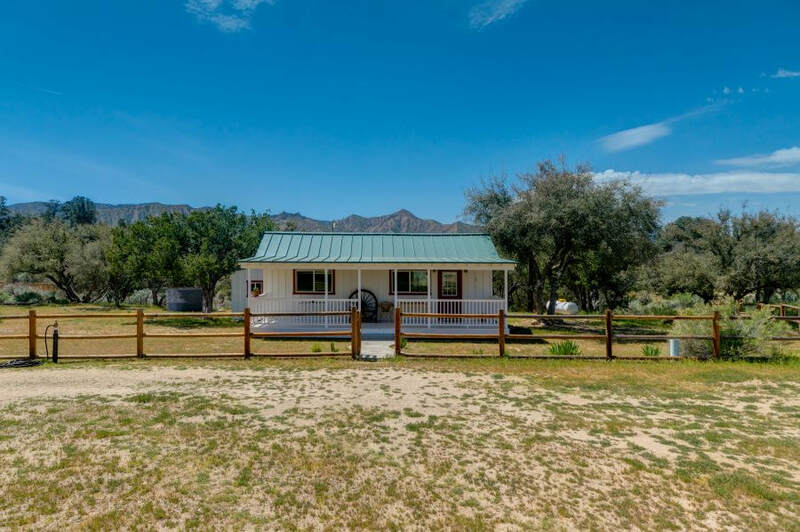 All of these homes have been recently renovated and have exceptional mountain views, welcoming outdoor living areas and necessities for rural living, such as back-up generators. The nearest grocery store, post office, gas station, hardware store and other everyday essentials are found in Cuyama and New Cuyama, which is also where pilots with private planes will find the New Cuyama Airport about 30 minutes to the north. 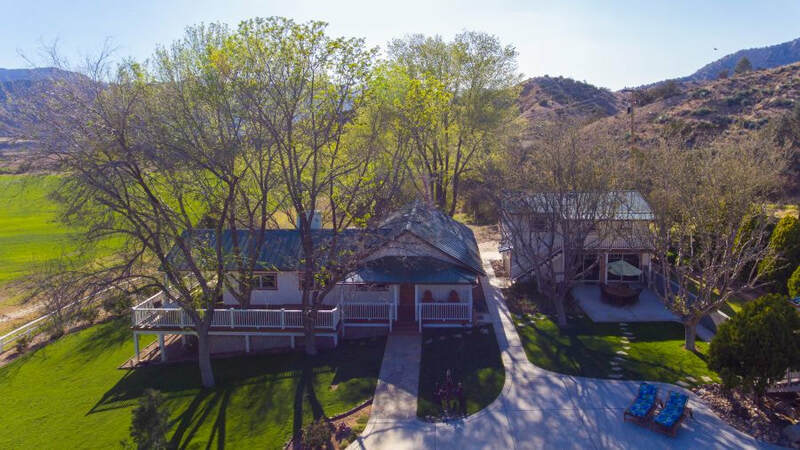 Together, the ranch house and the adjacent bunkhouse offer approximately 3,000 square feet of living space with four bedrooms and four bathrooms. 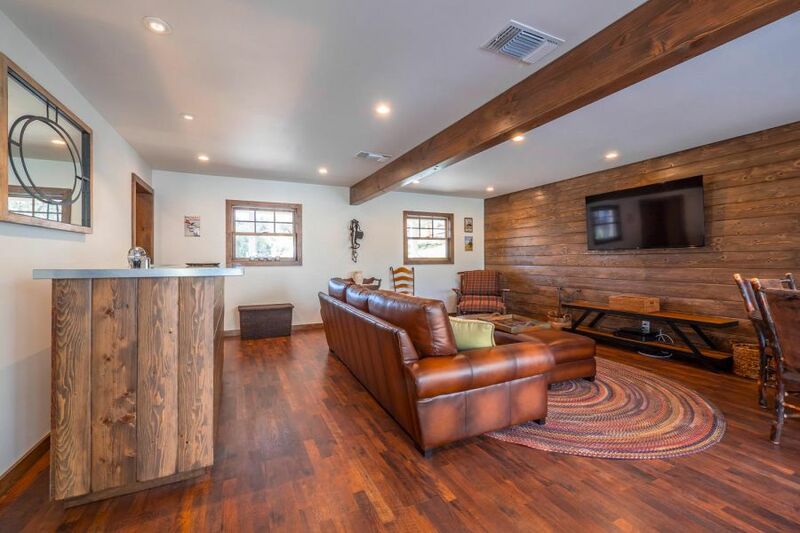 The beautifully remodeled ranch house has the perfect blend of modern elegance and rustic charm. 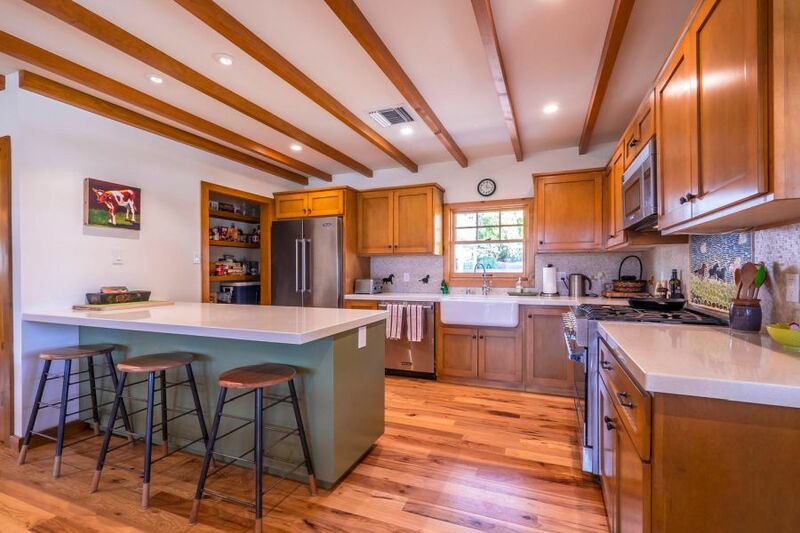 Vaulted, exposed-beam ceilings, gorgeous wood floors and rustic light fixtures bring warmth to the open floor plan, while Viking appliances and quartz counter tops are representative of the many modern comforts included in this welcoming space. 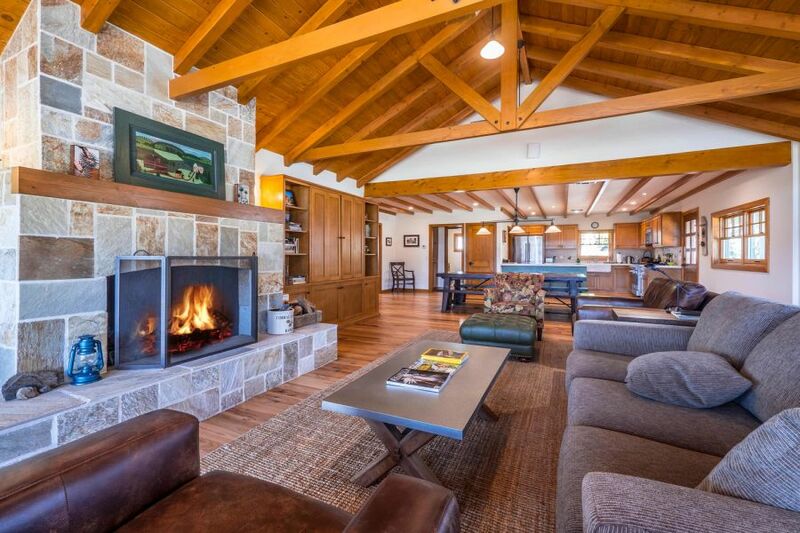 An impressive, stone tile fireplace is the focal point of the spacious living room, which also has a sliding door leading to a covered porch where you can enjoy some of the best views found anywhere on the ranch. This large, covered porch wraps around the house and is perfect for entertaining guests, but you are also going to fall in love with the idea of starting and ending your day sitting on this porch looking out over your spread. At the other side of the great room, there is a dining space with plenty of room for a large table just steps from the well-designed kitchen with a large pantry, farmhouse sink, custom tile backsplash, quartz breakfast bar, and Viking range, refrigerator and dishwasher. A powder room off the living area serves your guests, while the adjacent linen closet provides extra storage for everyday essentials. The wood floor and exposed-beam ceiling continues in the bedroom, where you will find a walk-in closet, lots of windows for natural light and amazing views, a ceiling fan, and an en suite bathroom with a tile floor and shower. 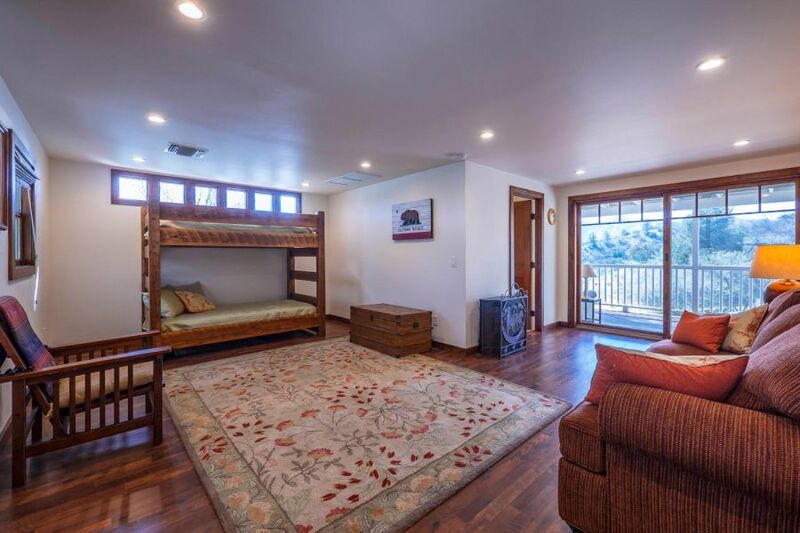 The adjacent bunkhouse is just a few feet from the ranch house and was designed in a manner that allows it to be used as a continuation of the ranch house or as a separate entertaining space and sleeping quarters. From the ranch house, the nearest door leads into the bunkhouse’s large laundry room, which is followed by a spacious rec room with two sliding doors to a covered patio. A powder room off of the rec room is conveniently located to serve your guests, which will come in handy, since this is a great space for indoor-outdoor entertaining. This first floor of the bunkhouse could also be used as a home office or creative space and, if you plan on using this ranch as a corporate retreat, this would also be the ideal meeting space where people staying in the ranch house, bunkhouse and apartment could congregate. The second floor of the bunkhouse is accessed from an exterior staircase and has a living area, two bedrooms and a bathroom with a tile shower and dual-sink vanity. There is a covered balcony at the front and a larger balcony that is covered and screened on the backside of the bunkhouse. A sliding door leads from the living area to the screened balcony, which is reminiscent of the sleeping porches of yesteryear. The apartment shares a driveway with the ranch house and the bunkhouse and is located just a few steps away above the four covered parking spaces serving this main housing area. From the large parking area, stairs on either side of the building lead up to a large, covered porch where your guests can enjoy gorgeous views while sipping their morning coffee. 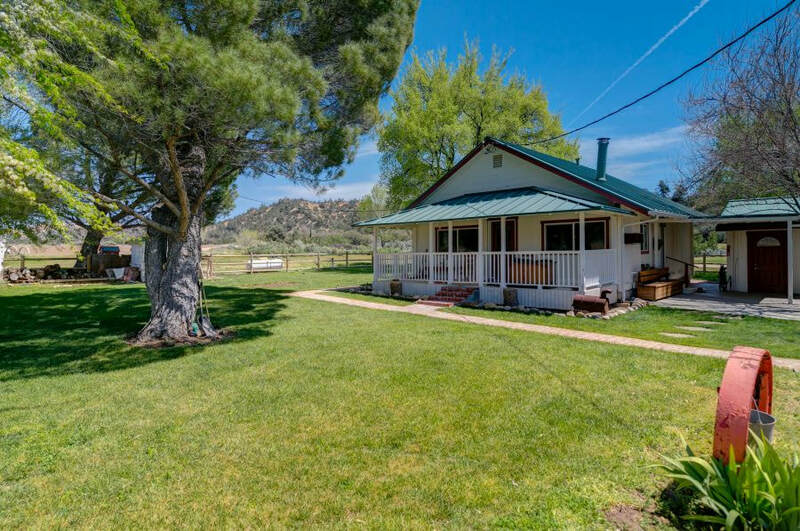 The proximity to the ranch house and bunkhouse makes the apartment a good choice for use as a guest house, maid’s quarters, or a living space for family members or long-term guests. This is also one of the homes on the ranch that could be rented out for additional income. Of course, you may decide to keep this space for yourself to use as an art studio or workspace. In the apartment, you will find two bedrooms with large closets and ceiling fans, one bathroom, a large living room with a ceiling fan and a sliding door to the covered porch, and a country kitchen with a tile breakfast bar and counter tops. The two-bedroom, one-bathroom foreman’s house is the first house you come to after entering the ranch. This allows your foreman to keep an eye on who is coming and going and allows him or her to easily access all areas of the property. 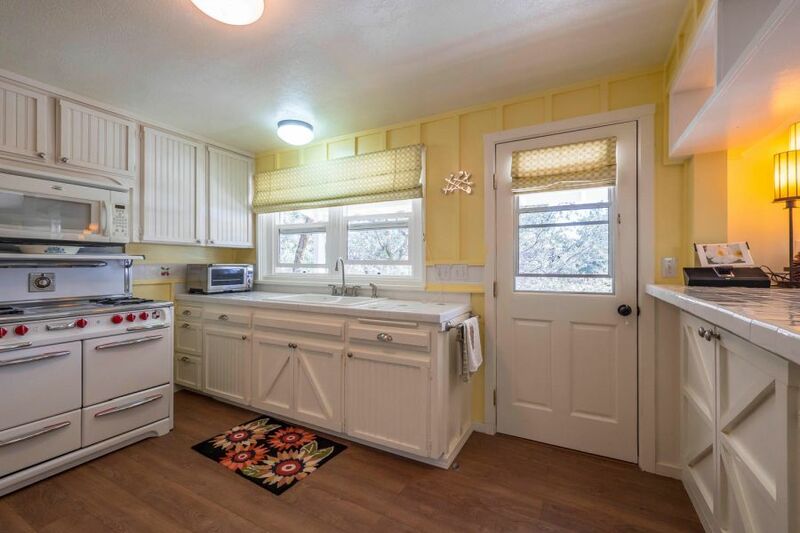 This cozy home has a wood-burning stove with a brick hearth in the living room, an eat-in kitchen with granite counter tops, and a bathroom with a tile floor, tile surround for the shower-bathtub combination and a granite counter top on the vanity. 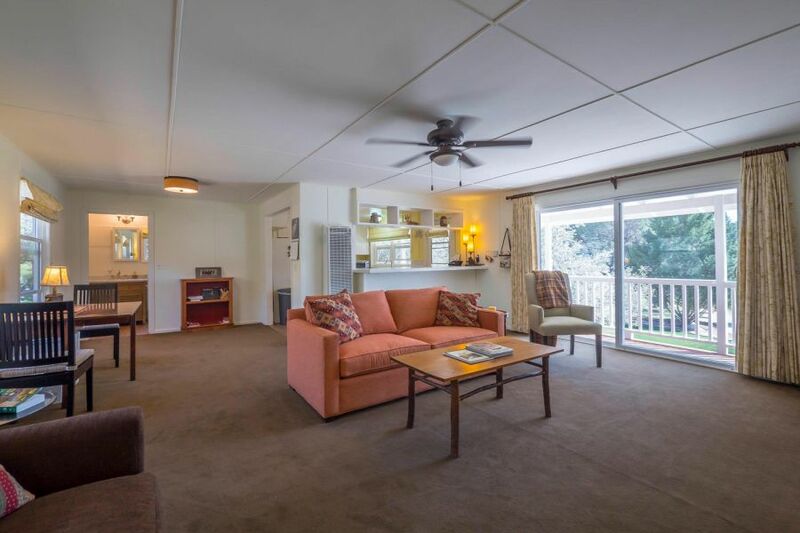 The two bedrooms have large closets, ceiling fans and large windows for natural light and views. In fact, there are great views from every window in the foreman’s house. The adjacent annex increases the space offered to your foreman’s family with a large room with a wood-burning stove and vaulted, exposed beam ceiling, a powder room, and a large laundry room with plenty of room for storage or to use as a craft room or hobby space. 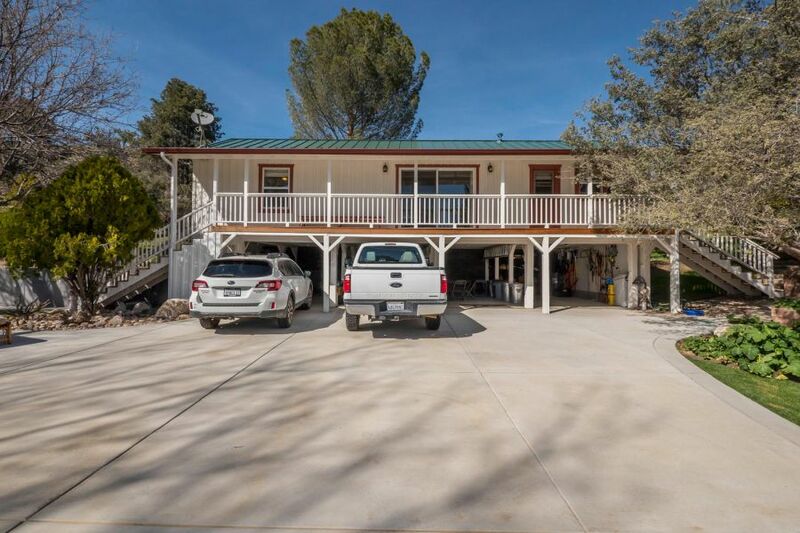 Outside, there is a carport, a fenced yard and a large, covered porch from which they can enjoy fantastic views of the ranch, rolling hills and mountains. 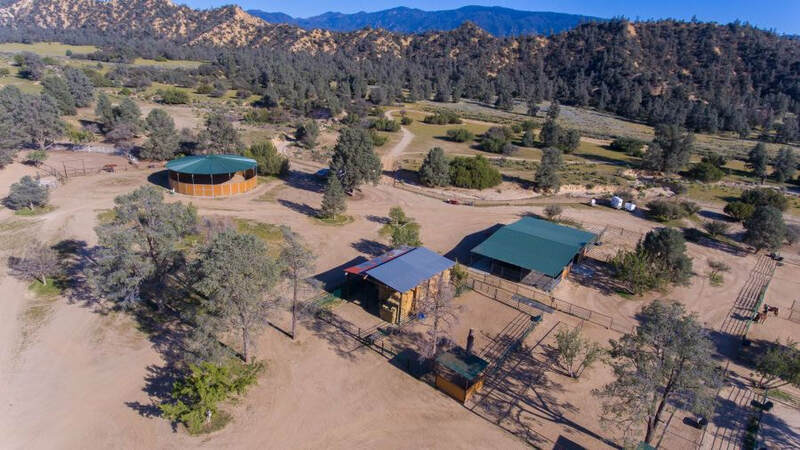 Conveniently located just steps away from the foreman’s house, there is a large equipment barn, machine shop, the well equipment, gas and diesel tanks, and a corral with a two-stall small animal barn. The Homestead House is an utterly charming, one-bedroom, one-bathroom cabin with an Old West feel and amazing views. 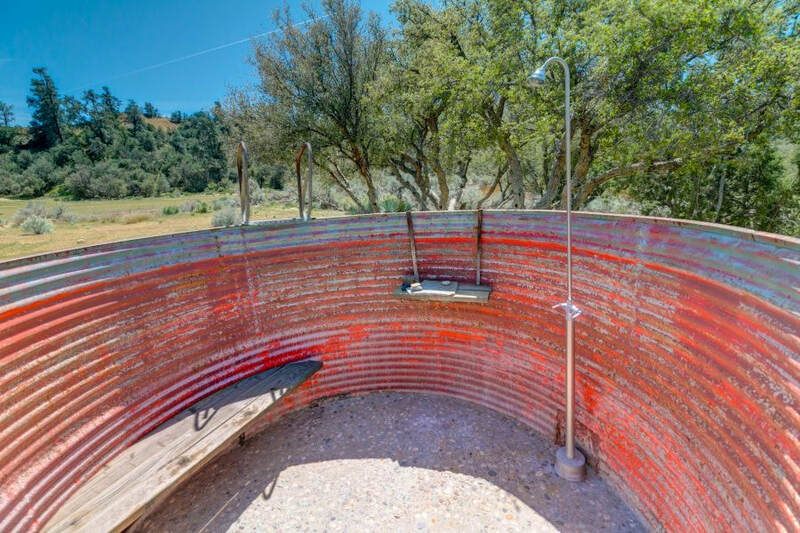 While the original home built on this homestead was long ago lost to history, this cozy cabin is built on the original homesite and even has an outdoor shower crafted from an old water tank once used on the ranch. Of course, while we all love cabins that harken back to simpler times, we also appreciate modern conveniences, so the Homestead House also has a shower in the indoor bathroom, as well as a bathtub and a vanity with a granite counter. You will also find granite counter tops in the kitchen where you can enjoy amazing views of the mountains and the seasonal creek. The adjacent dining area is open to the living room and both spaces have ceiling fans, as well as beautiful views of the ranch and rolling hills flanking the valley. The great views continue in the bedroom where you will also find a ceiling fan and large closet. Outside, there is a large parking area with a flagstone walkway leading to the large, covered front porch. On the backside of the cabin, a door from the kitchen leads to a patio with amazing mountain views and an attached shed, which serves as a laundry room and storage space. Plus, you have the above-mentioned outdoor shower where you can step into a transformed water tank to wash away the day under the stars. If part of your plan for this unique property is to bring in some income with a vacation rental, this is the house you would use for that. It is set far enough away from the main housing complex that folks staying in the Ranch House, Bunkhouse or Apartment could interact with short-term renters in the Homestead House only as much as desired but could enjoy complete privacy otherwise. Since it is located closer to the front of the ranch and just past the foreman’s house, there is less opportunity for vacationers to roam around the ranch in off-limit areas and more opportunity for your foreman to keep an eye on them. Alternatively, the Homestead House would make a great writer’s retreat to keep for yourself or to rent for a few months at a time to folks wanting to escape the city to work on their memoir or novel. This is how the Homestead House is presently used, and we cannot wait to read what the current writer in residence has been working on during his stay. The horse facilities are towards the back of the ranch and nicely separated from the houses. 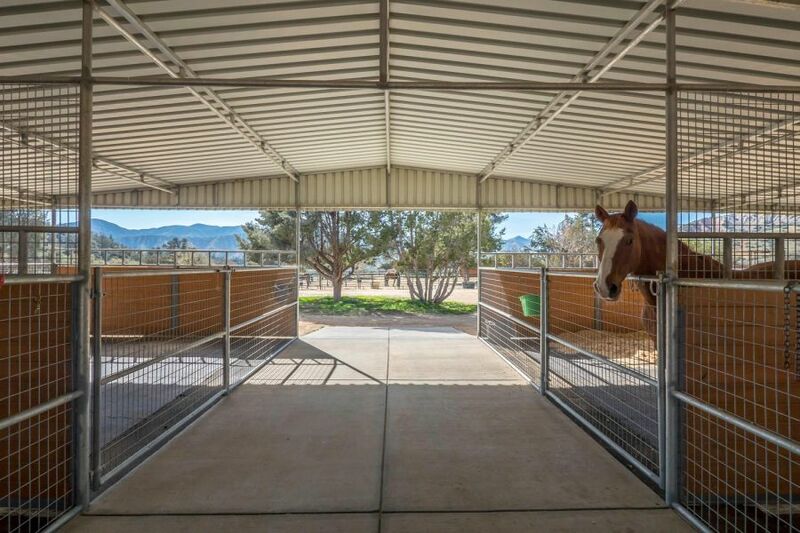 This separation allows you to run a business with clients visiting their horses or taking lessons in this area, while maintaining privacy for your home life. 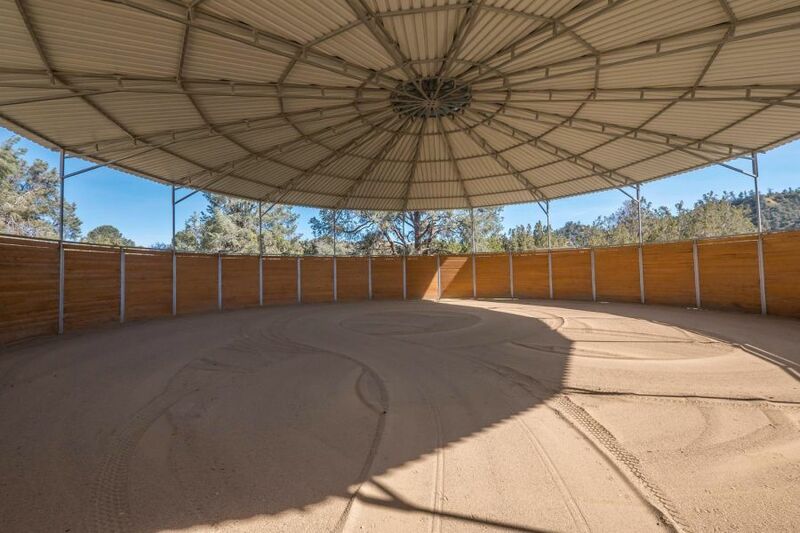 It also allows for the possibility of leasing this area out to a horse trainer or equine therapy program if you are not an equestrian. 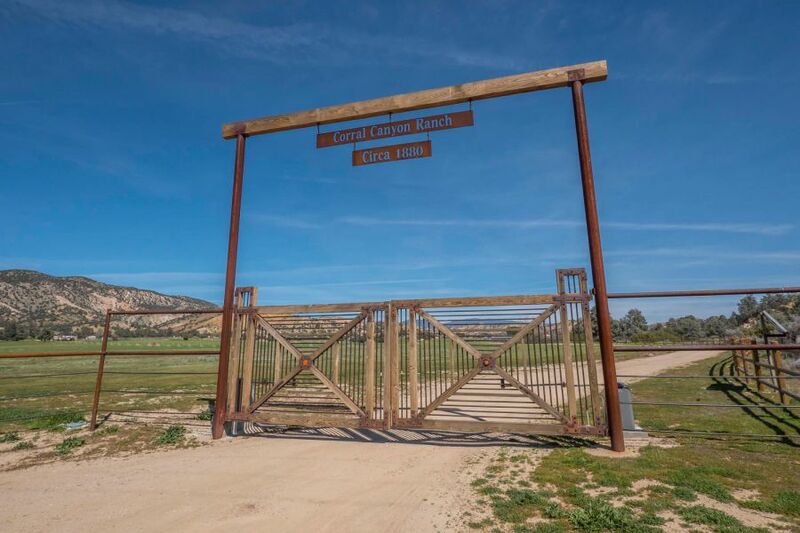 In this part of the ranch, you will find five pastures with shelters, paddocks with shelters, a feed storage building, rustic hay barn, 200' x 125' arena, covered round pen, and an eight-stall, open barn with mats and a tack room. There is also a two-stall small animal barn in a large corral near the foreman’s house. Also located nearby for your foreman to conveniently access is the well equipment and a large equipment barn with a machine shop and gas and diesel tanks. The main well is 55 feet deep with a dedicated line to three 5,000-gallon water tanks and the pump house. A float system signals the well to pump to fill the holding tanks. There is also an old goat well next to the pump house, and the previous owners had dug a large pond, so it may be possible to use this for additional water storage. The current irrigation system is set up for hobby growing but could be added to if you are interested in using this property for heavier ag. A map of the irrigation system is available upon request. 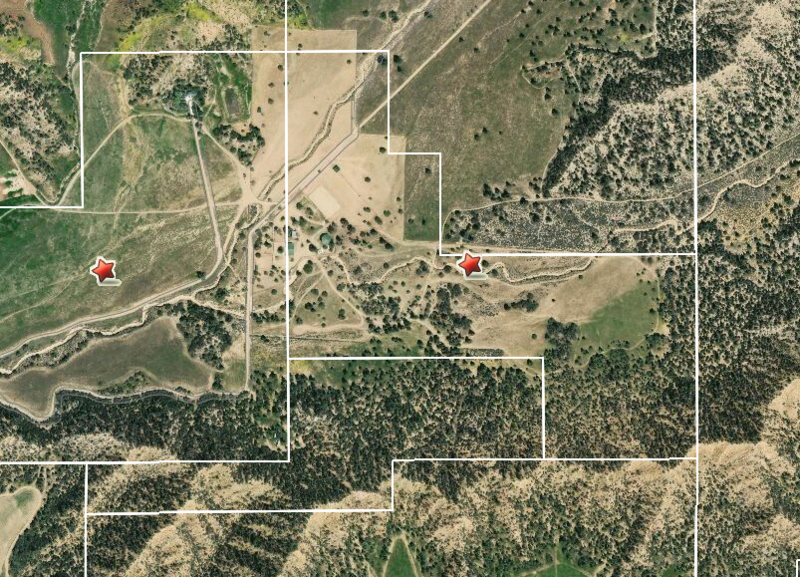 Also towards the front of the ranch you will find approximately 80 acres of hay fields that are currently leased to a neighbor for dry farming. Plus, there is a separate area where you will find historical remnants of the homestead’s cattle area, including cattle pens, a rustic shelter, and the original chute and scale. Hiking and riding trails wind through the ranch and into the adjacent Los Padres National Forest, and there is a fantastic arroyo carved through the property by the seasonal Corral Canyon Creek. Even with all that this ranch currently has to offer, there is still plenty of flat, usable land for other hobbies or ag, such as a vineyard or orchard. Contact Nora Davis today for more information or to schedule a tour of this unique California ranch for sale.